After having just successfully concluded an investigation, Cameron Cripps-Hayman never expected that the Metamora Action Agency would once again find themselves involved in murder. As focused as she was on the Canal Days grand opening of her sister Monica’s Dog Diggity organic dog bakery, Cameron couldn’t help but notice the body laying outside of the store. Cameron’s former community service group was last called into action to keep both her and her estranged husband out of jail, and now that another of their friends has been arrested the Metamora Action Agency is again on the case. Cameron knows that her handyman/budding filmmaker could never have committed murder, despite having recently received a black eye from the victim. Consisting of two seniors in age and two seniors in grade, the Metamora Action Agency must investigate a casino development and the victim’s angry heirs, all without ticking off the Metamora police force. Cameron’s marriage to investigating officer Ben Hayman is still on the mend, so having her amateur detectives involved is not making her life any easier. So it’s of course the perfect time for Cameron’s and Monica’s mother to arrive for a visit, taking over their lives and becoming an unlikely and terrifying ally of Ben’s mother. Fans of the first of this series will enjoy revisiting Cameron and her friends, and new readers will easily dive in as we are shown more of her family. Not in the least of these are the pack of adorable canines Cameron adopted, which include a giant Newfoundland, twofold still-unnamed twin mutts, and her stepdaughter’s tiny puppy. The relationships between the Cripps and Hayman women are entertaining and complex, especially as alliances between siblings and generations continue to change. Young Mia Hayman is definitely a teenager, able to exasperate her stepmother while at the same time displaying remarkable emotional support, intelligence, and wit. The differences between the women never become more apparent – nor more hilarious – than with the battle to lure Cameron into the exclusive, ruling cliques who are the Daughters of Metamora. Nothing can make an adult regress to the state of childhood more than the presence of a parent, and with her mother uniting with her mother-in-law, Cameron barely has a chance. Thankfully, she will have the support of her (mostly) reliable Metamora Action Agency, not to mention the unquestionable love of her furry companions. This charming mystery series makes the most of its small-town setting as it explores evolving family relationships, rambunctious but loyal canine companions, and the humans who cater to their every need. 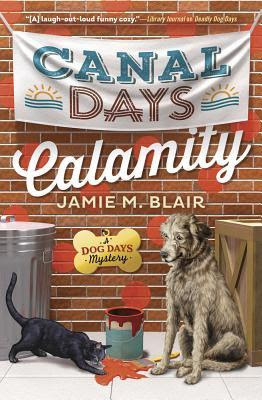 To enter to win a copy of Canal Days Calamity, simply email KRL at krlcontests@gmail[dot]com by replacing the [dot] with a period, and with the subject line “calamity,” or comment on this article. A winner will be chosen January 13, 2018. U.S. residents only. If entering via email please included your mailing address. If entering via comment please be sure to include your email address. Canal Days Calamity looks like a book I would really enjoy. Please enter me in the giveaway. New to me series! Thank you for the chance to win this one! Sounds like a series I need to try. I love mysteries with dogs or cats! Thanks for the chance! Great cover! Sounds like a really fun read. Would enjoy reading. I love mysteries with cats or dogs and I'm always looking for new authors and series to read and discuss with my book club.